Use this block to generate a text bubble to the user. Also this block can be used to generate a speech in voice driven channels like Amazon Alexa or Google Assistant. You can define multiple variants of the text. Thus the bot will select one of them randomly and send to the user. 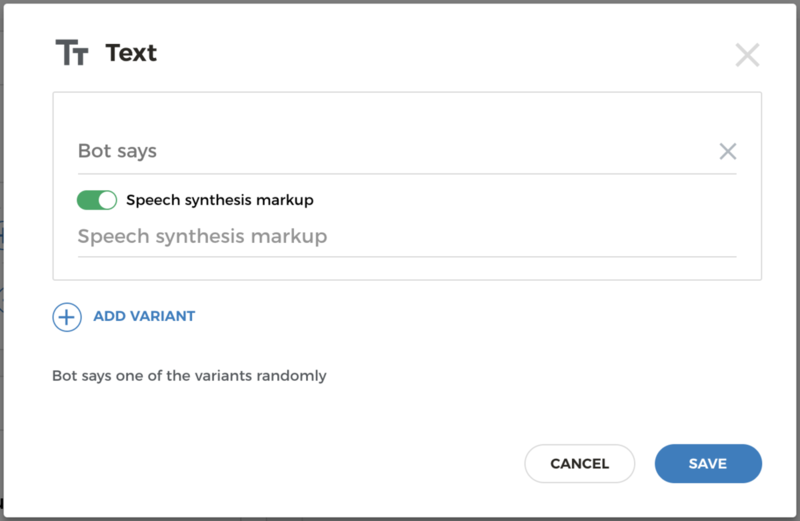 For each text variant you can define a speech synthesis markup - if you&apos;d like to customise the speech generation rules for this text variant. You can use SSML tags that are supported by voice driven channels like Amazon Alexa or Google Assistant. SSML tags enable you to customise a speech speed, pitch, tone, as well as add a non-pronounceable elements like short audio. Please learn more about supported SSML features for each particular channel in the corresponding reference. You can use variables in both text and speech synthesis markup to add dynamic data in the output. To add variable to the text output or speech just reference to it using a $ symbol before the name of variable. For example, if your bot has fetched some variable with the user&apos;s name from the external web service using HTTP Request block and stored it to the variable Name, then it can output the user&apos;s name in Text block. Just use the Name variable in the text like "Hello $Name". Aimylogic automatically replaces the variable with an actual value. Please learn more about variables in the Variables section. If you&apos;d like your bot outputs multiple bubbles with texts, just place multiple blocks one by one on a single screen.